Custom-designed mezzanines assemble quickly with the simplicity of "erector set" construction to form rugged, high-load-bearing overhead levels. 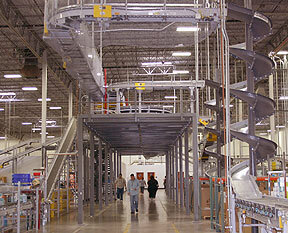 Special steel components engineered for mezzanines lock together to form a strong, unitized structure. Heavy-duty columns provide rigid support, eliminating obstructing bracing and providing maximum flexibility of movement and utilization of the lower level. Many options, and many other sizes are available. For complete information, submit a mezzanine inquiry for a guaranteed fast response, or call our Customer Service department at 888-877-3861 every weekday from 8:00 to 5:00 Central. Swipe the table horizontally on cell phones if needed.